½ cup of grapes contain 50 calories and less than 1 g of dietary fiber. Grapes are also good sources of vitamins A and C as well as minerals like manganese, iron and folate. Grapes contain an antioxidant known as resveratrol which lowers high blood pressure and reduces the risk of developing blood clots. 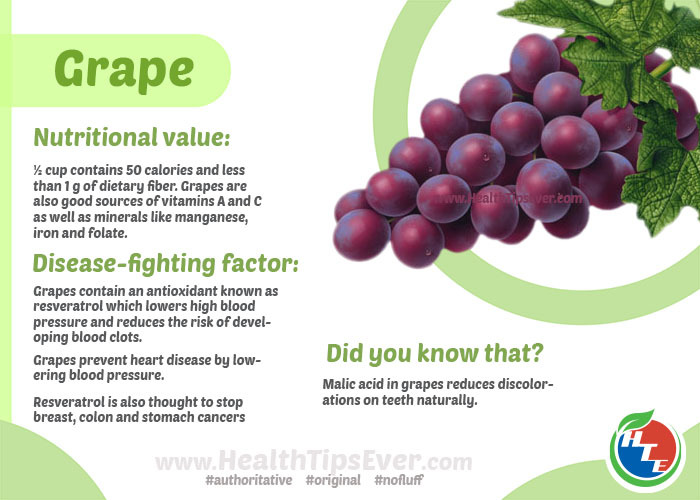 Grapes prevent heart disease by lowering blood pressure. Resveratrol is also thought to stop breast, colon and stomach cancers from spreading. Malic acid in grapes reduces discolorations on teeth naturally.